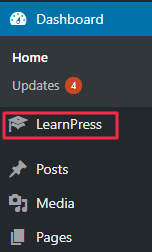 In this session, we are going to show you the simple steps to How to create online course with WordPress using LearnPress Plugin? 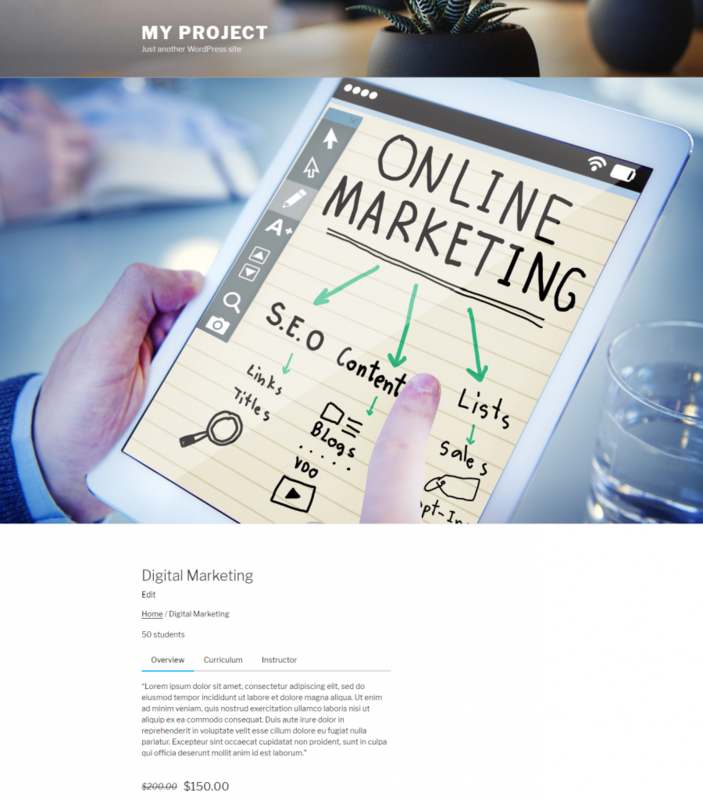 With the steps, you can easily create an e-learning website or online schools or universities. Trust me on this, your site will be nonetheless than popular e-learning websites like Coursera, udemy, codecademy and others. Learning Management System is a type of e-learning that delivers and manages all types of educational courses and training programs. 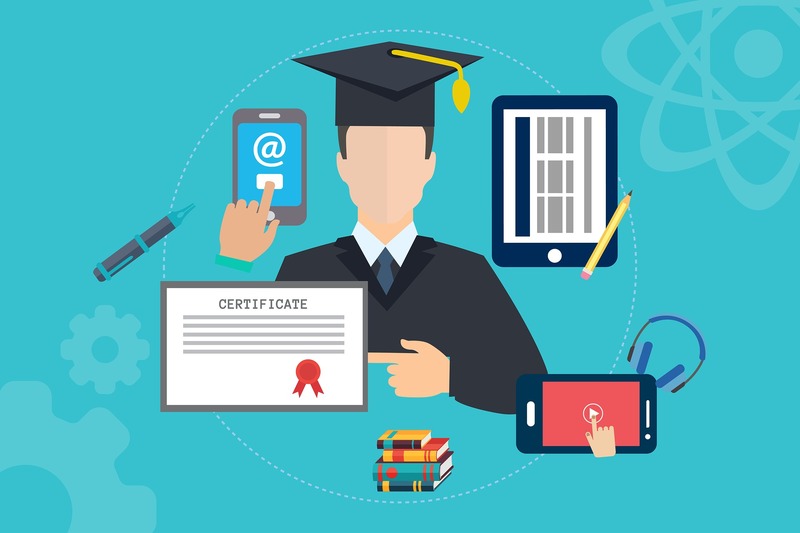 Not only educational or online institutions but many other enterprises, non-profit organizations, government sectors or agencies, are using LMS for providing training, courses, orientation, instruction, discussion boards and much more. With LMS you can create lessons, or courses, deliver them to your students and track students attendance and performance. As it is suitable for discussion boards, both students and teachers can exchange their feedbacks as well. LearnPress is one the best free WordPress LMS plugin which enables you to create a course and sell them via their online educational website. It has a very user-friendly interface that allows creating a course syllabus and curriculum. What’s more, it contains both free and premium add-ons which, undoubtedly, helps to craft an online education website more functional. In order to create online course with WordPress using LearnPress plugin, first of all, you need education or LMS WordPress theme. Why WordPress? Because it is an open source content management system that offers various free and premium WordPress themes, which are easy to customize and any users can configure the theme settings and craft a website without writing a single line of coding. Further, there are several WordPress plugins, that has various includes and functionalities to make the website building task more efficient and make it more powerful. Let’s get to the point, you will get different free and premium education WordPress themes in most popular WordPress theme directory WordPress.org and Themeforest.net respectively. Now, the main part, which type of education or LMS WordPress theme you want to select for your e-learning website. There are free themes which are doing great that most of the premium education or LMS WordPress website. Similarly, if your project is big and the features and functionalities are not enough to meet your need, then it is better to go for premium LMS or education WordPress themes. If I am not wrong then too many choices paralyze our decision. It’s just not you only, this happens to us as well. For your convenience, I have taken care of this part. There is one LMS or education WordPress theme that perfectly needs to your needs. That is Education Park Pro, premium WordPress theme. Because Education Park Pro is one of the best premium LMS or Education WordPress themes. It is a perfect platform for creating school, university, college, training programs, skills development classed, institutions or any kind of educational orientated website. The theme comes with all the essential customization options, that allows you to create LMS site without worrying about a single line of code. For the further flexibility and usability, it has drag and drop which lets you manage and arrange sections on the home page. Another reason is, this theme is integrated with LearnPress Plugin, which enables you to create a course, a quick inquiry of the course and also add the bio of the respective course teacher. 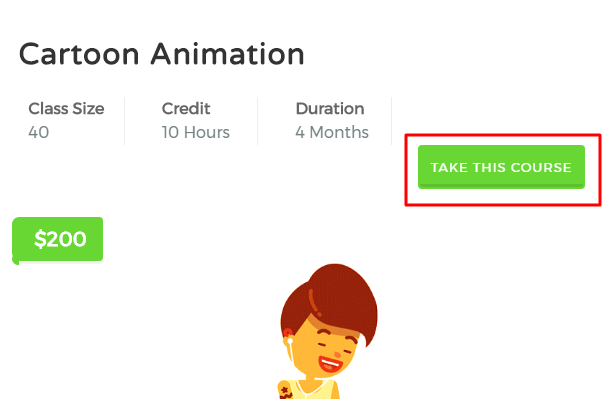 Likewise, Education Park is compatible with WooCommerce plugin, which means you can sell courses, and other e-learning materials, audiobooks, and so on. After purchasing, then comes installation. Click on the course option and then go to Add New Course. There you can add courses as much as you want. Further, you can add course categories, course title, and description, course instructor, the price of course and image from Add New Course. Or, if you find add new categories from Add New section, then you can simply add courses categories from Courses>Courses Categories>Name>Add New Categories. You can add a description as well. To set the Course Enquiry. Go to single course page>take this course and click submit. The sidebar is not mandatory on the website but it helps to provide further information. It also helps to display contents beside the main content creating multiple layout options like right sidebar, left sidebar layouts for the users. The sidebar includes a list of pages, popular articles, recent articles and so on. You can also use the sidebar to display advertising of other parties. 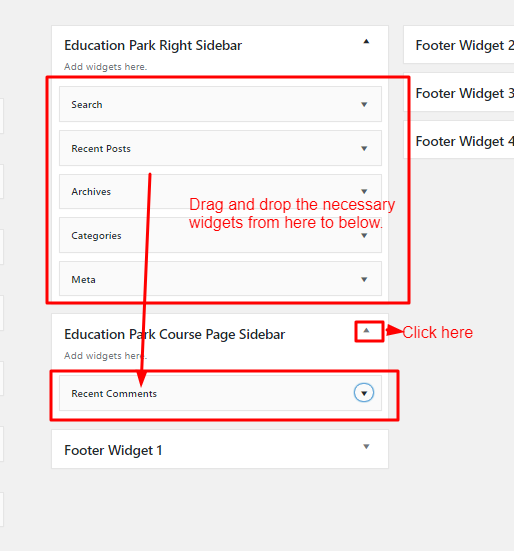 Then click Education Park Course Page Sidebar and drag and drop widgets from Education Park Right Sidebar to Course Page Sidebar. See the clarified picture below. This is how it seems after adding Widgets. How to manage Course Archive? Course archive page contains category at the top and all course list below the category. In order to view the course archive, simply click on course on the home page. After redirect to the course page, one can find links Course in the breadcrumb and click on it. Below is the image for course page. First Install LearnPress Plugin, then activate it. After activating, you can see LearnPress on the top left side of the Admin Panel Click it, you will see various options. Then, start adding your Course. You can also add further information like Course Description, Course Duration, Price, Maximum Students, Course Result, Feature Image, Author and Review Logs. From Course Settings, you can set Course Duration, Assessment, Pricing, Review Logs, and Author. If you wish to Add category of your course. Then, simply Click Category>Add new Category. 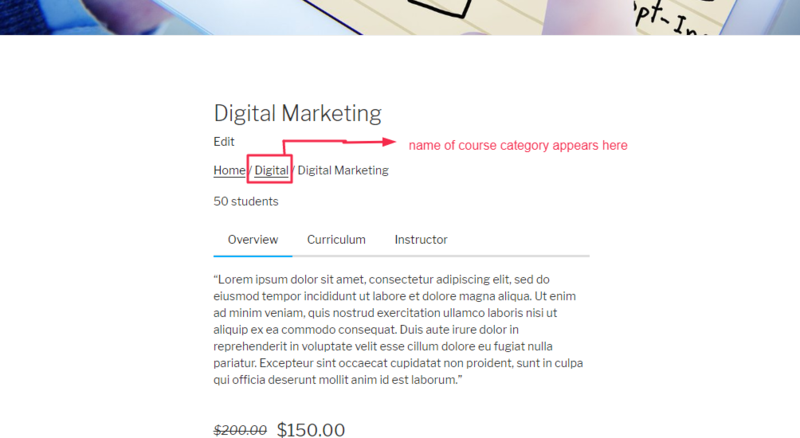 Then add name of course category and description, then click add new course category. Then go back to course, then select the desired course which you want to be categorized. One the Course Category you will the name of the course category you have just created. Yeah, now your site is ready to roll. Your students can take a lesson from your LMS Site. 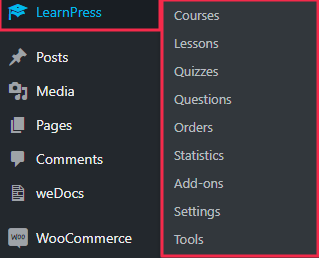 I hope now, you can create online course with WordPress using LearnPress Plugin. You can add further possibilities by using LearnPress add-ons. Still confused, then feel free to write in our comment section.